In Florida, there are many homes that are built around small courtyards having a view of the courtyard from all rooms in the house. Small areas, which can be a challenge to landscape, can be the true focal point of your home – if done right. Keeping plants neat and organized and watching their size will ensure the area will not be overwhelming. 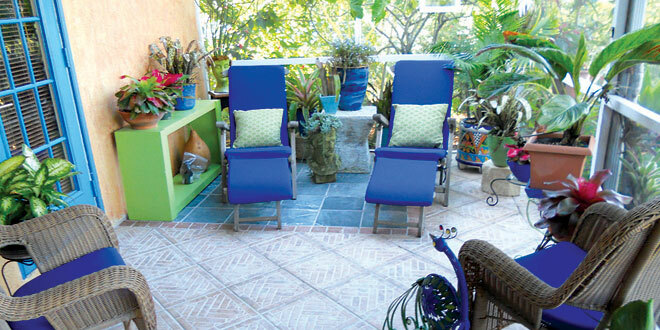 Creating your own tropical paradise can be fun and rewarding even if you live in a condo with a small lanai. Planting a small tree in your courtyard can really bring the outdoors in. Depending on your preference, it can give you shade, color with flowers and even fragrance. Watch the height of your tree because many courtyards have a screened roof. Planted in a pot or designated flower beds, a small tree is certainly worth the time and effort. Filling the area underneath your tree with many different sizes, shapes, textures and colors of flowers and plants will round out your little piece of paradise. Remember not to over-plant; this will keep the area open and airy. Fountains, whether permanent or portable, provide running water which can bring a soothing and relaxing sound to your courtyard garden. Fountains come in thousands of shapes, colors and sizes. Be sure to choose one that is suitable in size to fit your special area and not to place it where it becomes overwhelming and creates an annoyance. You can create your own Niagara Falls by making the water flow too heavy creating a loud and annoying sound, or too slow creating a dripping effect like water torture. Depending on your mood, adjust water flow carefully. Another way of introducing plants to your courtyard or lanai is by using pots and planters that are on the larger side, which will make the area seem bigger than it is. Try to use pots with the same or similar color to create a serene atmosphere rather than a lot of different colors which might seem confusing and circus-like. For instance, when using Mexican Talavera pottery, which uses many colors on each piece, planting different colored flowers would make a very confusing effect. Pick out a primary color and go with it. When you are selecting flowers for your pots use colors that blend with the pots, your outdoor furniture and any garden art that you may have. As always, planting in mass is the way to go. This will create an organized and calming retreat. Some of my favorite plants for small areas or courtyards are Crotons, Bromeliads, Alocasias and Calocasias. Vines grown on a trellis can be kept in check with a little selective clipping. Bamboo in containers also makes great accent plants. White candles (Whitfielda elongata) and giant white Begonias (Odarata) grow extremely well in containers. Large leaf Philodendrons and Anthuriums, especially the giant leaf Anthuriums, are another good choice and give a very tropical look. All these plants will grow well in shade or partial shade. In sunnier locations, cactus, succulents and euphorbia will thrive with very little care. Remember that if your planting area is under screening that will cut out about thirty percent of the sun’s rays. Enjoy your courtyard garden and KEEP BUTTERFLING!!!! !